Literature for Children: A Short Introduction, 8/e is a concise, accessible, text that provides a solid understanding of the foundations of children’s literature across its various genres from picture books to folk literature. In his usual engaging style, popular author David Russell stresses that students need to first appreciate literature in order to later use and teach it effectively in their own classrooms. The text’s user-friendly format includes a wealth of real examples from literature, and its concise presentation allows students to spend more time reading actual children’s books. Substantially updated to bring the text and its resource lists in line with today’s most current scholarship, the Eighth Edition includes a list of the winners of the Orbis Picture Awards for children’s nonfiction, annotated recommended booklists, and discussions of important topics such as the Common Core curriculum, using technology in the classroom, teaching folktales, twenty-five uses of poetry, and critical approaches to literature that demonstrate a variety of ways of reading children’s books. 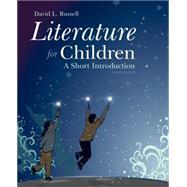 David L. Russell has taught children’s literature courses at Ferris State University in Michigan for over 30 years. He is the author of Patricia MacLachlan and Scott O’Dell, both Twayne critical biographies, as well as numerous scholarly articles in various journals. A member of the Children’s Literature Association, for which he served as Treasurer and Publications Chair for several years, he is currently co-editor of The Lion and the Unicorn, one of the premier professional journals in the field of children’s literature.